Eric Burgoyne was the Regimental Sergeant Major of the British Sumatra Battalion and this is his story of his time as a Prisoner of War of the Imperial Japanese Army and the story of the band of 500 men that became The British Sumatra Battalion, commanded by Captain Dudley Apthorp of the Royal Norfolk Regiment. The book opens with the Fall of Singapore and the escape of Eric and others after the surrender, all trying to make their way to Sumatra, and freedom. The fact that an official escape organisation existed was one of the many facets of information mentioned in this book of which many people may well be unaware. Once on Sumatra, further escape proved to be impossible, captivity being the only alternative. This is the story of the British Sumatra Battalion, from its formation to the surrender of the Japanese in August 1945. Eric chronicles his experiences of the Battalion in a very frank and honest manner, with compassion and at times humour and in very clear detail. His loyalty to his commander, Captain (later Major) Apthorp has to stand many tests during the period of captivity and not only from the Japanese. Eric started writing this book just after the end of the war, which will account for the degree of detail in the writing. He is the artist whose drawings appear in 'The British Sumatra Battalion' and 'Sunset over Saigon', both now sadly out of print. The originals are with the Imperial War Museum. He and other members of the Battalion assisted Major Apthorp's widow Ann in writing her book, completed from her late husband's papers. With the decision to pay £10,000 to the surviving FEPOWs and widows came Eric's chance to get his book published. It has been dedicated to, and published in memory the men of the British Sumatra Battalion, to leave behind their story for the generations that follow, seeking information. 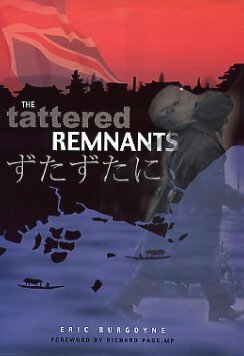 'The Tattered Remnants' will not only be of interest to those looking for information about the British Sumatra Battalion, but to anyone who has any interest in the story of the Far East Prisoners of War, and is well worth taking the time to read. Mr. Eric Burgoyne, 159, Tudor Way, Rickmansworth, Hertfordshire, WD7 2HN. Cheques payable to Eric Burgoyne please.